The untold story of the FBI informants who penetrated the upper reaches of organizations such as the Communist Party, USA, the Black Panther Party, the Revolutionary Union and other groups labeled threats to the internal security of the United States. 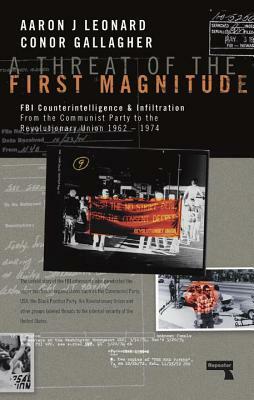 A Threat of the First Magnitude tells the story of the FBI’s fake Maoist organization and the informants they used to penetrate the highest levels of the Communist Party USA, the Black Panther Party, the Revolutionary Union and other groups labelled threats to the internal security of the United States in the 1960s and 1970s. As once again the FBI is thrust into the spotlight of US politics, A Threat of a First Magnitude offers a view of the historic inner-workings of the Bureau’s counterintelligence operations — from generating "fake news" and the utilization of "sensitive intelligence methods" to the handling of "reliable sources" — that matches or exceeds the sophistication of any contenders. Aaron J Leonard is a writer and historian. He is a regular contributor to Truthout, Rabble.ca, The History News Network, PhysicsWorld, and Canadian Dimension. His research interests focus on twentieth-century US history, particularly Sixties history. Conor A Gallagher is a researcher and educator from Brooklyn, New York. He has a masters degree from the University of Southern California, Rossier School of Education. He currently lives with his wife Michelle in China where he teaches history. Their book Heavy Radicals: The FBI's Secret War on America's Maoists was published by Zero in 2015.